Solid black polled female out of our Red Caesar Sire purchased at Ankony in 2007, and an own daughter of Hart Hollywood Queene, now own by Leslie Scott. Solid black heifer calf at side born 3/14/2013, whose sire, HSF Big Sky 59S 90W, the full brother to the Top Money producer at the Wilkinsons in North Dakota. 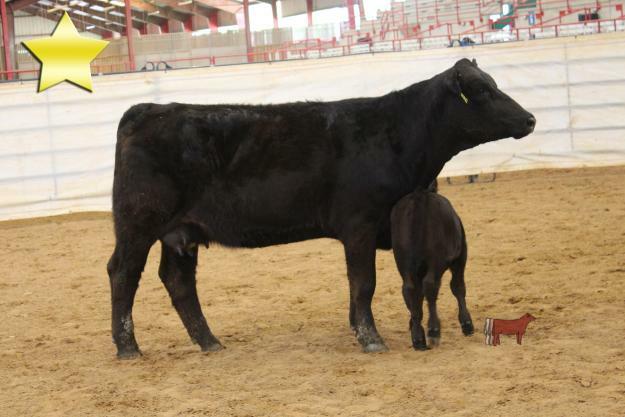 The heifer calf is paid up for next years ETSSA Heifer Futurity, so Juniors take note. She may be your next Blue Ribbon Winner. For more information call 903-450-6236. Consigned by Bois D' Arc Land & Cattle.